All of the reasons why Trumpcare failed. You can’t unite a party that is fundamentally divided. 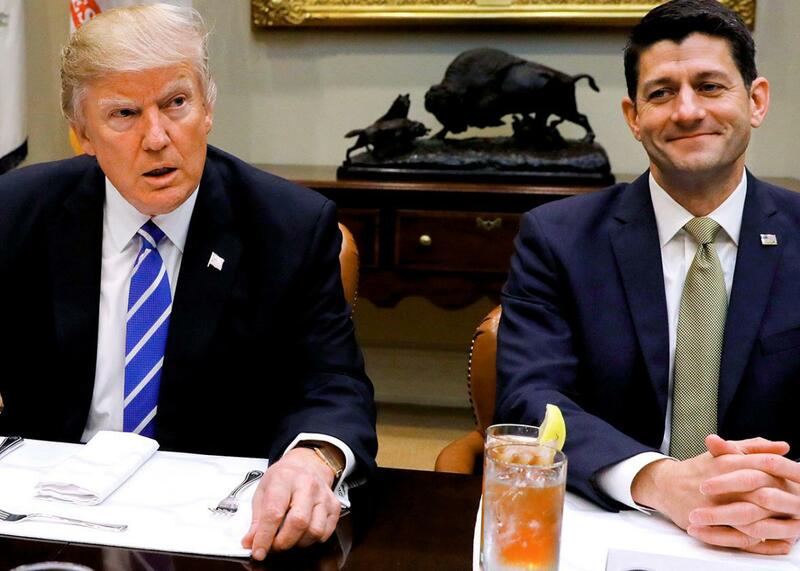 President Donald Trump and Speaker of the House Paul Ryan attend a leadership lunch at the White House on March 1. Republicans’ effort to repeal and replace the Affordable Care Act failed on Friday. It failed because legislating on health care is hard. Successfully doing so involves a lot of trade-offs and, if it’s to be meaningful, will disrupt people’s lives. Only once in modern times has a party successfully pushed through comprehensive health care reform—Barack Obama and the Democratic Party with the Affordable Care Act in 2010. The tactical mistakes made along the way are all symptoms of that underlying cause. Probably most of those tactical mistakes, too, were the least worst of a slew of bad options. Leaders could have tried something else at all of these turns and found themselves failing in a different way. But let’s run through the tactical mistakes anyway. It was a rather large mistake to promise to “repeal and replace Obamacare” for seven years without having any idea how to do that. It was a mistake, too, to test-run an Obamacare reconciliation bill in 2015—a bill that repealed much more of the act—for messaging purposes, when they were always too scared of such a harsh bill being signed into law. All this did was set an expectation baseline for conservatives that wouldn’t be met. It was a mistake to try to pass health care reform through reconciliation, the limits of which prevented them from legislating a complete health care vision that members could sell to their constituents, leaving them with only a half-measure pleasing no one. It was a mistake to insert a repeal of essential health benefits into the bill, and lose a wave of moderates, without first getting conservatives to commit their votes. It was a mistake for them to emphasize, from the beginning, quick passage over consensus-building as the strategy for moving this through Congress. That last one is the most excusable, since leaders recognized that there was no intra-party consensus to be reached. But if there’s no consensus, then it’s not worth trying. The differences that divide this party are far deeper than a disagreement on the level of some subsidy here or some regulatory ratio there. The difference is that some Republicans believe that the federal government should have a role in health care, and others don’t. Freedom Caucus members have a cold vision of health care reform, but a coherent one. They believe that the government being involved in health care, either through regulation or subsidies, is the factor driving up prices, and undoing all of that architecture is what’s necessary to allow market forces to drive down prices. Being coherent in this way on health care policy means accepting the trade-offs that your vision entails, and Freedom Caucus members accept that this approach would leave a lot of vulnerable people in the lurch, left to the care of charities and communities. They have an odd belief that a vast majority of the American public shares this vision despite representing only a small percentage of the House of Representatives. “Moderate” Republicans and rank-and-file members don’t get off any easier. They can’t support the nefarious Obamacare, and what the free marketers want would be political suicide. But … what do they want? They didn’t answer this question, so they got what conservatives dubbed “Obamacare Lite.” Party rhetoric had made the individual mandate so toxic that, when their bill needed a similar mechanism to ward against adverse selection, they landed on a lesser idea called “continuous coverage” that would only worsen adverse selection. They had railed against the bill’s tax increases so much that, in order to pay for their repeal, they slashed and burned Medicaid spending, which a large number of their constituents rely upon. That’s not a way to muster popular support for your bill! The ACA’s income-based tax credits for people to purchase plans on the individual market, meanwhile, were so visibly evil and socialist that they resorted to … smaller age-based tax credits! And when those age-based tax credits shockingly didn’t align with people’s needs, they decided to means-test them—i.e., to include an income factor, like the ACA’s. The Affordable Care Act made the Republican Party go insane. It occupied the space of what had been the center-right vision for market-based health reform and combined it with a Medicaid expansion popular among progressives, boxing the party out from the area where consensus might be had. With that model—originally designed by a right-leaning think tank and first implemented by one of the party’s former presidential candidates—made unacceptable in order to demonize a sitting Democratic president, though, Republicans had a choice: a coherent far-right free market approach, or some amorphous blob of other. They chose an amorphous blob of other, sliced up into muddled “prongs” in accordance with Senate rules. It failed. Health care will be back again, even if what President Trump said on Friday—that it won’t be in the “near future”—is true. When it is, though, Republicans will have a choice. They can choose to do what their own congressional politics prevented them from considering—working with Democrats to improve upon the existing system—or they can hope that the pressure to act next time will be so great that it will override party factionalism. They should give it some time before answering. His advisers may want to brief him.